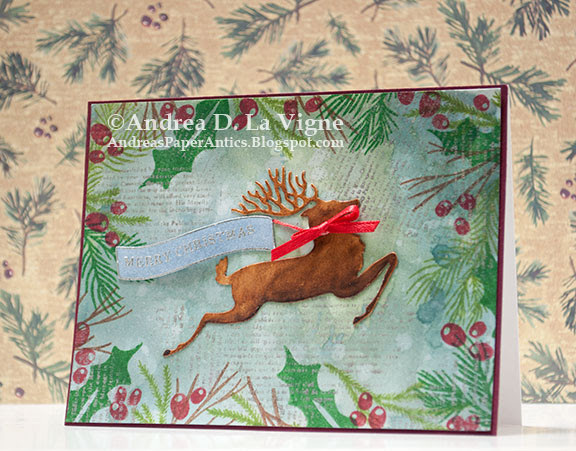 I've been participating this past week in Online Card Classes' holiday card class, "Merry Making." Shari Carroll inspired this card with her lesson on Day 2, demonstrating "paint resist." I cut a panel of Strathmore Smooth Bristol paper to 4-1/8x5-3/8" for my background. I stamped the Hero Arts "Newspaper Background" stamp with silver paint, following the tutorial. I also used Distress inks in Iced Spruce, Bundled Sage, & Stormy Sky on my background. Finally, I stamped around the perimeter with images from Hero Arts' "Pine Branches" set. I die cut Impression Obsession's "Reindeer" (apparently discontinued) from more bristol paper, and colored him with 3 shades of brown Tombow markers. Then I blended the colors with a water brush. I ran him through my Xyron machine to coat the back with adhesive. Because his antlers are so delicate, I didn't want to use liquid glue, and have it ooze out the sides. Finally I adhered him to my panel. For the greeting, I stamped half of one of the "Build a Banner" images from Avery Elle (apparently also discontinued) onto more bristol, and heat embossed it with Ranger Silver embossing powder. I also took a greeting from Hero Arts' "Vintage Christmas Post" stamp set, curved it to match the banner, and stamped & heat embossed it. I fussy cut the banner out, inked it with Stormy Sky, and adhered it with Scor Tape on either end & a bit of foam tape in the center. I cut 2 small slits on either side of the reindeer's neck, and threaded through some red ribbon, taping the ends to the back. I also pierced a small hole on either side of the banner end, and threaded red embroidery floss through those holes. I threaded the other ends through the slit along the back of the reindeer's neck, so it looks like he's pulling the banner. Finally, I tied a bow from the same red ribbon, and adhered it with a glue dot. To finish my card, I adhered my background to a piece of burgundy cardstock cut to A2 size, and mounted it on a white card base. I'm entering this card in A Blog Named Hero's October challenge, "Calling All Critters." A gorgeous card with a traditional feel to it, I love it.